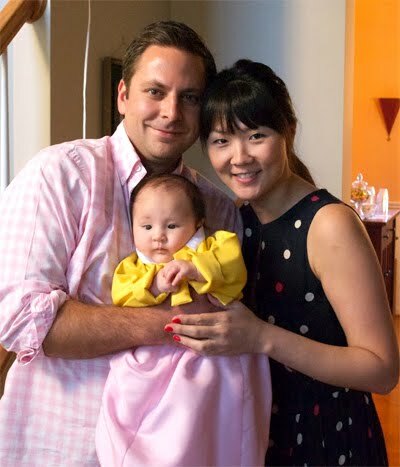 This past Saturday, we celebrated Victoria's Baek Dol, which is a Korean tradition that marks the 100th day of a baby's life (can't believe she's already 3 months old!). Before modern medicine, it was considered auspicious for the child's health if they made it to their 100th day. This milestone continues to be celebrated today and is one of the most joyous occasions in the Korean culture. 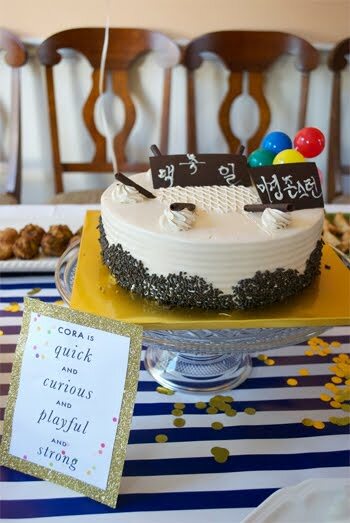 Between recent baby shower events and my husband's 30th birthday, I didn't have much time (or energy) to plan Cora's 100th day party. But somehow it all came together, thanks to my parents (for hosting it at their house), my brothers (for helping me and dealing with my inner task master), and my husband (who calmed the inner task master in me all while holding Cora). While it was a small gathering, I took it upon myself to kind of go all-out. I really wanted to do something fun and colorful for Cora's 100th day celebration (gotta get some good photos! ), so of course a Kate Spade theme was what naturally came to my mind. 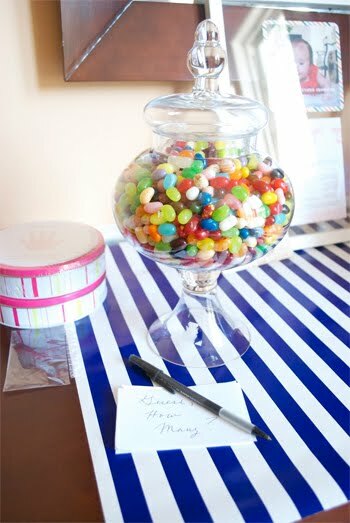 My plan of action was to incorporate polka dots and stripes into the tablescape with fun pops of color. So where did I go first to find some items? Target of course! Remember when I featured Mara-Mi products from Target? Well, they came through for me again but this time with plates and napkins. 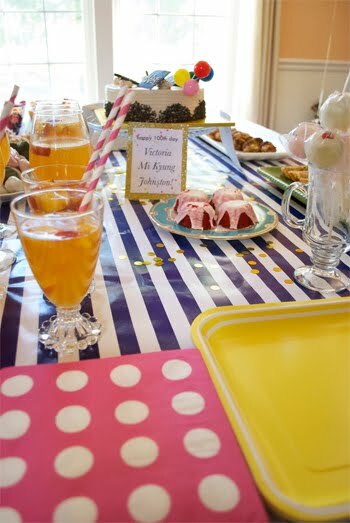 I picked up some bright yellow plates along with pink & white polka dotted napkins, and green & white polka dotted dessert napkins. 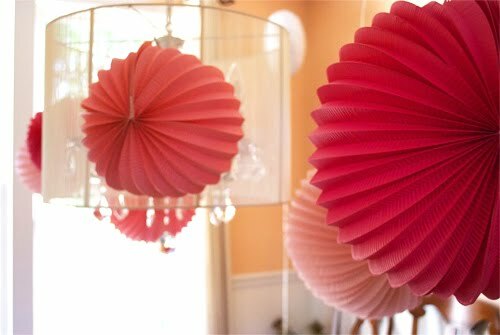 Then I went to Michaels for some Martha Stewart pleated paper lanterns. I also got some gold glitter paper to create these Kate Spade inspired cards to dress the table with. The next stop on my shopping expedition was Party City. I was hoping to find a black and white striped table cloth, but had no such luck there. BUT, what I did find was blue and white striped wrapping paper. I know what you're thinking. Wrapping paper for a tablescape? I tell ya what though, I only used it as a wide table runner and it added the hit of Kate Spade-ness that I wanted on my table. Plus, at $3.99, you can't beat the price AND I still have more to use in the future. I was also able to get some large gold confetti to sprinkle on the table as you'll see below. Used the same fonts found in Kate Spade paper products (Baskerville and Futura). We got the baker to write in Korean, "Happy 100th Day Mi Kyung Johnston!" on the cake. Large gold confetti adds the hit of glam I need to complete my Kate Spade table. 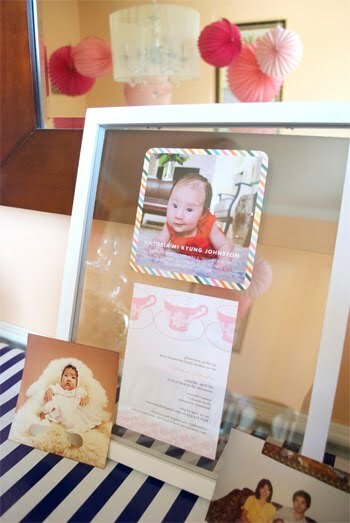 As added decor, we framed Cora's birth announcement (we're sending them out this week, promise!) along with my lovely baby shower invite. And yes, that's me in the bottom left photo on my 100th day. Cora is clearly much prettier. Cora's first outfit change of the evening. A cute cream pleated dress from Gap Kids. 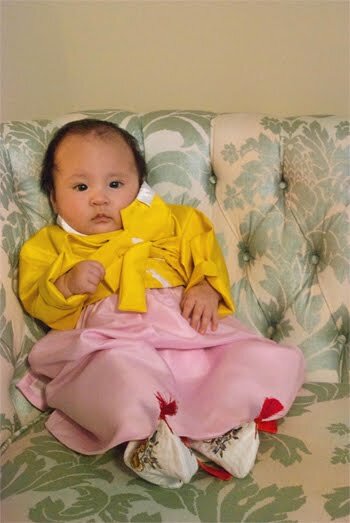 Her second outfit, a custom Dol Hanbok - a traditional Korean dress for a little girl. 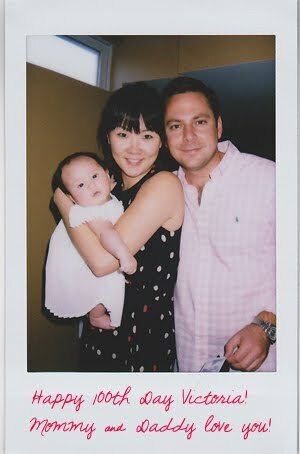 Steve had the great idea of taking polaroid pictures of everyone with Cora and having them write a message to her to commemorate the day. 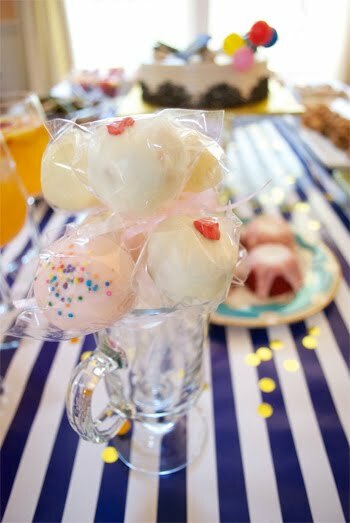 It was a great way to incorporate everyone with her, and to take some fun photos throughout the party. Love this! You guys are so cute! This is beautiful! So creative! 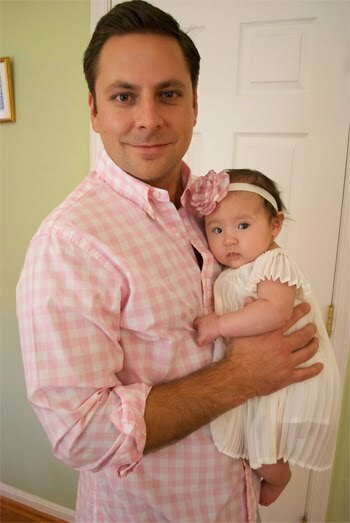 you baby is adorable! 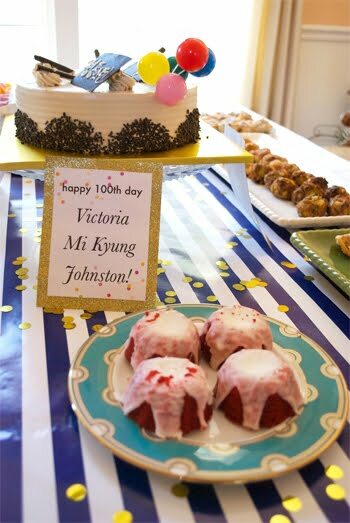 Happy 100 day Victoria!